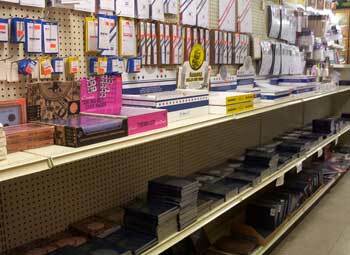 We carry many different books for the philatelist -- or stamp collector; and other books and accessories for numismatics -- coin collectors. Stamp collecting is the most popular hobby in the world. However, if you are not a collector you may be asking, "Why stamps? Aren't stamps just pictures on little pieces of paper?. Scientifically speaking, yes that's correct. However, there is so much more to stamps that people of any age, any income and any interest can find some aspect of stamp collecting appealing and very satisfying. Stamps represent historical events, people and places. Its an easy stepping stone to learning as much or as little about world or local history as you want. With the aide of a good stamp catalog the world is at your fingertips. Stamps makes learning fun and you might not even realize that you are learning. Its like visiting exotic places from your own living room. Here are a few very common areas of collecting: topical (ie: birds, castles, Disney), Precancels (ie: US or foreign), Machins (Queen Elizabeth heads), Perfins (stamps with holes punched into them), classics (stamps issued in the 19th century), forgeries, airmail and postal history, just to name a few. The advantage of stamp collecting is it allows you the ability to spend as little or as much money as you want. Many areas of collecting cost less than 15c a stamp, while others can cost in the $1000s. You can chose! There are no time constraints with this hobby. You can dedicate as much time as you want. You can take periods of time off from the hobby and when ready, jump right back in. This hobby offers great flexibility. There are many excellent reasons why you might want to collect coins. For starters, coins tell unique stories. A coin's design, mint mark, condition and composition can offer a glimpse into history and a better understanding of the past. Some people collect coins in the hope that they will appreciate in value. Some coins have intrinsic bullion value (such as silver, gold and platinum coins). Others become valuable because they are rare. Coin collecting, one of the oldest hobbies, was once practiced only by kings and the wealthy. That's why coin collecting often is called the "king of hobbies" and the "hobby of kings." Coin collecting became increasingly popular in America during the 1930s when United States commemorative coins became widely available. Today, there are millions of coin collectors in the United States alone. The thriving coin-collecting community, which includes clubs throughout the United States provides numerous opportunities for collectors to meet and trade.